One of the most stunning parts of a medieval castle is the castle keep. Essentially a fortress within a fortress, the keep was built to be the last line of defence within a castle. Many medieval castles were able to withstand aggressive attack sometimes suffering an outer wall breach, only to resist and finally repel the attackers from within the confines of their castle keep. 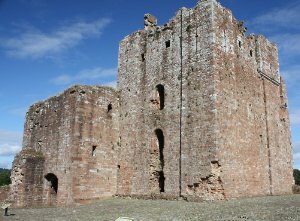 One particularly outstanding example of a castle keep is that at Brougham Castle in Cumbria, England close to the border with Scotland. Although a ruin, the bulk of the keep is still intact and makes for a wonderful sight on a summer's day. It is a great example of medieval castle architecture and well worth including on your itinerary should you ever be in the Border region. Photographing castle keeps is something we make a point of every time we visit a medieval castle and we have compiled a stunning array of photos to date, particularly of castles in England and Scotland. Hopefully we'll find the time to upload a gallery on medieval-castle.com soon. Alas, not enough hours in the day .... but we'll get there! In the meantime, I will keep (pardon the pun!) writing about them within our castle blog so please revisit soon for more on great castle keeps, including those within haunted castles!